The lovely double flowered form of Fair Maids of France. Found in the Vosges Mountains of France, this beautiful plant has dark green, dissected leaves and masses of double white, button flowers on tall stems held clear of the foliage. 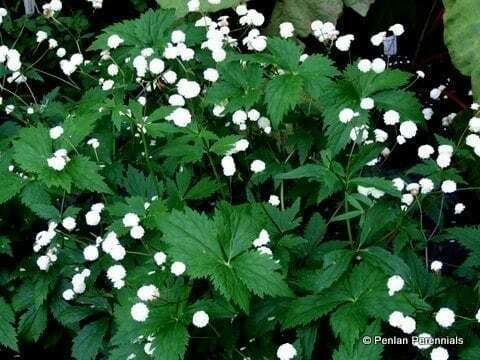 It enjoys a moist to wet soil in sun or part shade. 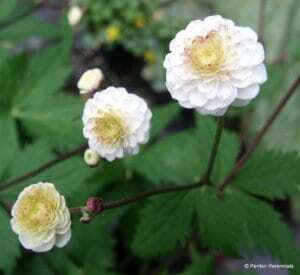 Superb as a waterside plant or just as happy in a moist soil which does not dry out in summer. Rarely offered. AGM. Hardiness rating H7. A member of the buttrcup family and thus ultra hardy. You can only propagate by division as the plant is sterile.